Tamanawas Falls is a madly popular hike on both weekdays and weekends, for good reason. 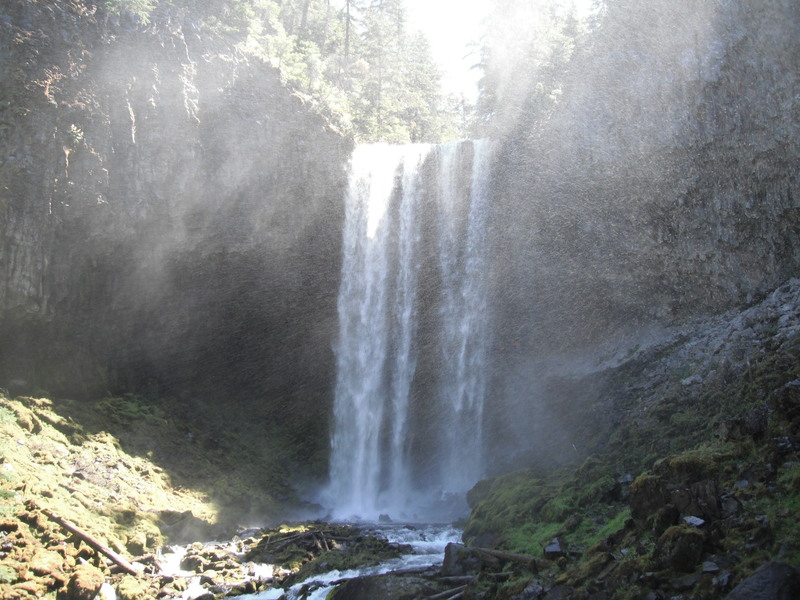 It’s close to Hood River, it’s an easy hike, and it can be completed in half a day. On a blistering hot summer day, the spray from the falls works like a natural swamp cooler, keeping the natural amphitheater below quite cool. The first 1/2 mile of the trail winds along highway 35. The light summer traffic means hiking above the freeway isn’t a horrible experience, but it’s not exactly pristine. After the trail takes a left turn into the woods, it becomes much nicer. For the next 1.5 miles, the trail follows Cold Springs Creek up to the falls. The trail is well-marked, shady, and, despite the heavy foot traffic, still retains a wilderness feel. If you’re looking for a solitary wilderness waterfall experience, you’re going to have to go elsewhere, but hiking in 2 miles for a 100 foot waterfall is a good tradeoff. Take highway 35 approximately 25 miles south of Hood River. The trailhead is a couple of miles or so past the Cooper Spur turnoff on the right. Or… if you get to Sherwood Campground, you’ve gone 1/4 mile too far. It’s hard to miss the large parking area. It’s on the right side of the road and is likely full of cars. For a short hike with beautiful waterfalls, this is hard to beat. 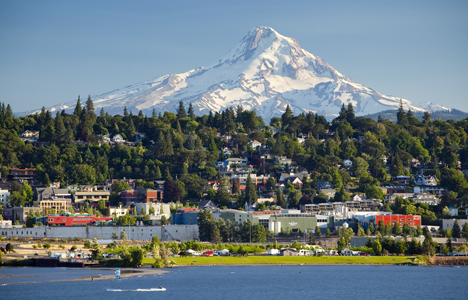 To get there, cross the Hood River Bridge to Washington and take SR-14 west to Carson. Take Highway 30 north. After passing the Carson National Fish Hatchery, turn right on Highway 30 for about 3/4 mile and turn right on Forest Road 3062, proceed approximately 1 1/2 miles to the trailhead at the end of the road. The trail gradually climbs through the forest for a couple of miles. In spring you’ll see wildflowers, and in the fall, you’ll see beautiful fall leaves and maybe a few edible mushrooms. After you get to the falls, keep hiking to the top, where you’ll find a deep, clear pool suitable for swimming (with your clothes on, of course) and picnicking. There’s also a Lower Falls Creek trail. 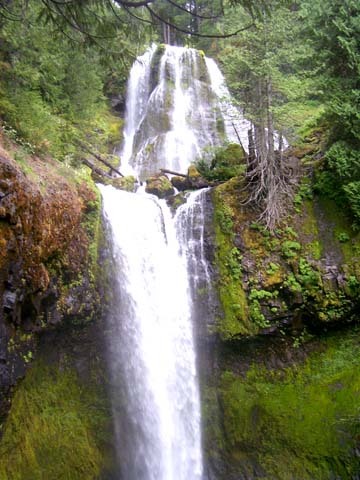 According to the Gifford Pinchot NF website, to get there you follow the same directions for Falls Creek Trail #152 Upper Falls Creek Trail EXCEPT after driving approximately 2 miles on forest Road 3062 turn right on Road 057. Continue 1/2 mile to the trailhead. There’s a suspension bridge involved in the hike, along with a creek crossing, which can be difficult during spring high water. Difficulty Rating: 2/5 due to some elevation gain and the chance you’ll get your feet wet.